You can download the sample file that is the result of everything described in this post. It’s entirely artificial, but I’ve tried to call out in the post how things would work a little differently in a real-world situation. This is the massively artificial part of this exercise. 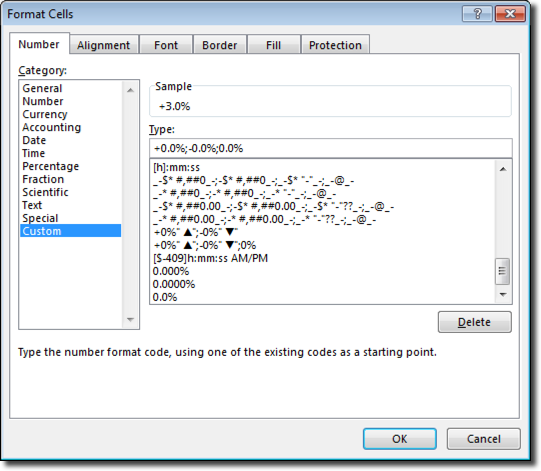 Cell C6 below is the number we’ll play around with, while cells C7 and C8 are simply set to be equal to C6 and will show a couple of different ways that that value can be represented with better formatting. In the real world, there would just be one cell with whatever formula/reference makes sense and the most appropriate formatting for the situation used. For Formatted value 1, we’re going to put a +/- indicator before the value, and an up or down graphical indicator after it. 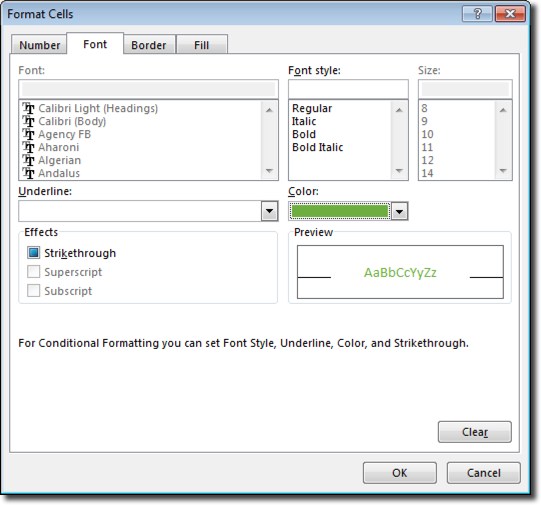 We’re also going to turn the cell text green if the number is positive and exceeds our specified threshold, and we’re going to turn it red if the number is negative and exceeds that threshold. 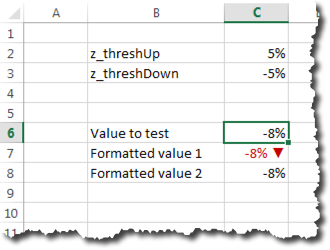 For Formatted value 2, we’re going to add the +/- indicator, one decimal place, and have the up/down arrow in the cell right next to the number. That arrow will only show up if the positive/negative value exceeds the threshold, and it will be colored green or red as appropriate. You would never use both Formatted value 1 and Formatted value 2, but they both have their place (and you could even do various hybrids of the two). 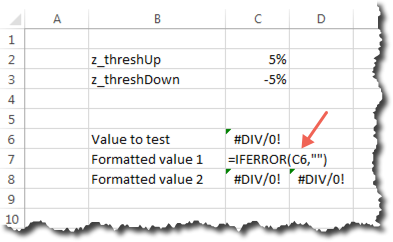 Note that I’m not using the “[color]” notation here because I only want the values to appear red/green if the specified thresholds are exceeded. (The “,FALSE” in the formula above is not strictly necessary, but my OCD requires that I include it). That’s really it for Formatted value 1. The same process works for positive values, but how many screen caps do we actually want in this post? Try it out yourself! Another approach I sometimes use is an indicator in its own cell, and only showing the indicator if the specified thresholds are exceeded. That’s what we’re going to do with Formatted value 2. 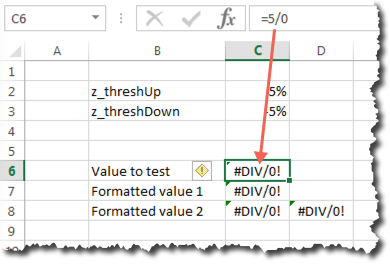 We’ll want to add the same conditional formatting to cell D8 that we added to cell C7 to get the arrows to appear as red or green as appropriate. We’ve already covered all the basics, but it’s worth adding one more tip: how to prevent errors (#N/A or #REF or #DIV/0) from ever showing up in your dashboard. 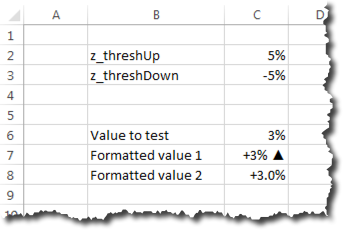 If the dashboard is dynamically pulling data from other systems, it’s hard to know if and when a 0 value or a missing value will crop up that breaks a formula. Recurring dashboards and reports should be as automated as possible. When they are, it’s impossible to know which specific values should be the “focus” from report to report. 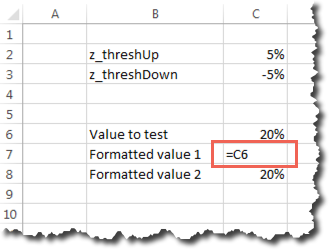 Conditional formatting and custom number formatting can automatically make the most dramatically changed (from a previous period or from a target) values “pop.” The recipients of your reports will love you for adding the sort of capabilities described here, even if they don’t realize that’s why they love you! And, remember, you can download the sample file and play around with the thresholds and values to see all the different ways that the Formatted values will display! 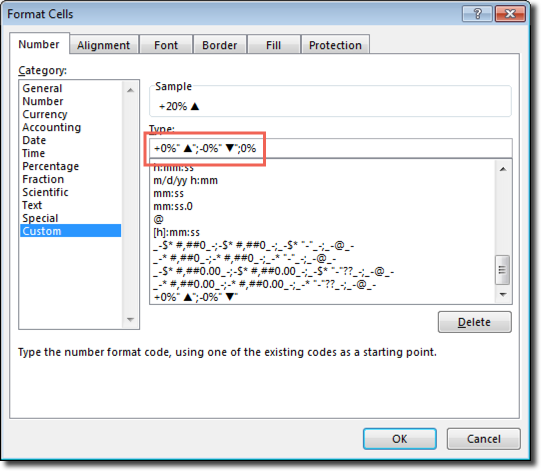 The TEXT() function is a cousin of custom number formatting. It actually uses the exact same syntax as custom number formatting. I try not to use it if I’m simply putting a value in a cell, because it actually converts the cell value to be a text string, which means I can’t actually treat the value of the cell as a number (which is a problem for conditional formatting, and is a problem if I want to use that cell’s value in conjunction with other values on the spreadsheet). 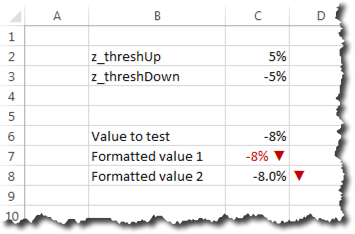 ="The up arrow appears if the % change exceeds "&TEXT(z_threshUp,"+0%;-0%")&"." Nifty, huh? What do you think? Thanks, guys! 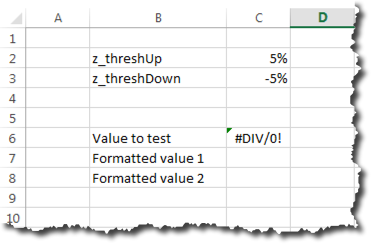 It seems like I’ve been in a habit of being overly verbose in my conditional formatting setup. I’ll get this updated (and change my ways going forward! 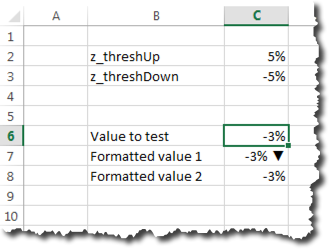 Thanks for sharing the great article on excel tips. It is really helping. I needed to do conditional date formatting, so that I’d only include the month in the format if the month changed from the previous date, and otherwise just have the day of the month. Perfect! Thank thank you for mentioning the TEXT function! I had some helper calculating columns in the P5 range (where the raw dates are located) and the AB5 range (doing a =MONTH(P5)MONTH(P4) calculation. 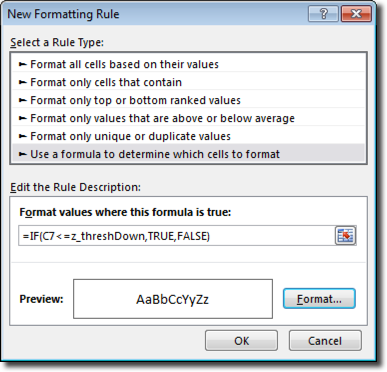 I could have consolidated all the logic into the custom formatting formula, but much easier to maintain the raw data separately, and made the custom formatting formula a lot simpler. Ah. Slick! That sounds like a good way to keep date ranges written as a human being would write them — only including the month when it’s necessary to recognize that the range crossed the start of a new month. I like it!